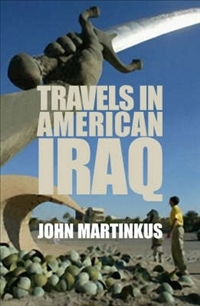 Celebrated Australian journalist John Martinkus has covered conflicts in East Timor, Iraq and Afghanistan. He is the author of A Dirty Little War, Indonesia’s Secret War in Aceh, Quarterly Essay 7: Paradise Betrayed and Travels in American Iraq. In his spare time, he works for SBS Dateline and teaches in the journalism department at the University of Tasmania. We recently talked to him about his article in the new Overland, ‘Kidnapped in Iraq; attacked in Australia’, which recounts his experiences in Baghdad in 2004, and what transpired when he returned to Australia. After Howard, it might have been hoped that a new era of political responsibility toward honesty and humanity prevail; in your opinion, has there been any shift in the politics of journalism and reporting? I think it is fair to say that the support for the Iraq war shown by the press in Australia and, particularly by the Murdoch press, was so unanimous that by simply reporting the truth about what was happening in Iraq back then was enough to have a deluge of scorn brought down upon individual reporters. The fact is that many of these writers, editors and producers who came to prominence in this time are still in positions of power in the media in Australia and are still able to use their positions of influence to try and avoid scrutiny of the positions they took on issues and editorial decisions they made back in the early years of the Iraq war. In other words I won’t be holding my breath to hear or see the ‘we were wrong to support the misguided and badly conducted war in Iraq that has led to more than 102,000 Iraqi civilian deaths documented by Iraq Body Count since 2003’ editorials in Murdoch papers. I think what is more likely is that they will become more shrill in the defence of their previous decision to support the Iraq war. I think readers can make their own minds up and it is the job of journalists to get out there and report to give the public the information they need to make informed decisions. The journalists who accused me of ‘siding with the enemy’ are the ones who are also constantly advocating for one side of politics and hysterically denouncing any individual or organisation that doesn’t reinforce their extreme right wing positions as left wing and generally carrying on as if they are in a McCarthy-era communist witch-hunt. I do hope this era in Australian journalism will end but I know it won’t, at least not until these individuals, resign, pass on or become a liability to the newspapers and interests they serve. What I also wanted to do in writing this piece was hold to account the former foreign minister Alexander Downer, the DFAT staff who dealt with this case and their supporters in the press. I wanted to ensure that in the future no other journalist has to endure the psychological pressure of being discredited and attacked politically in the immediate aftermath of a deeply traumatising event. Want more? Subscribe to Overland. The article is a compelling read, John and thanks for this post. I wrote to Downer at the time of John Martinkus’s kidnapping, asking about the Australian government’s duty of care towards its citizens. I received a boilerplate reply from the Department – not even from the minister’s office – saying in effect that if he had kept to safe places he would have been OK and that everything was as it ought to be. I don’t know how Downer lives with himself.